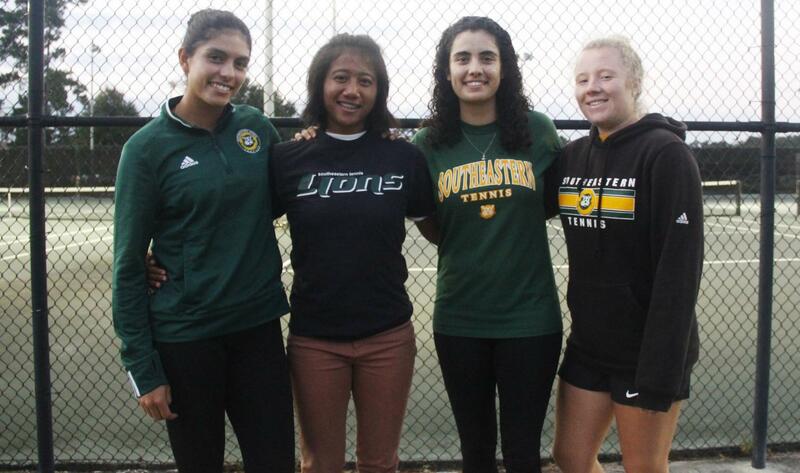 Katya Cornejo, Putri Insani, Ximena Yanez and Bernadette Dornieden are international student-athletes on the tennis team. They enjoy the motivation they receive from their head coach. The university is home to over 250 international students from over 70 different countries who contribute to the diversity on campus. Of these international students, many play sports and represent the university. The nationality of these students range from Mexican to German. The tennis team is a prime example since it has a comparatively larger percentage of international athletes compared to other sports programs. Ximena Yanez, a sophomore biological sciences major, is from Mexico. She shared that she loves playing tennis for the university because the students create an atmosphere of accommodation. Yanez talked about the responsibility she holds in playing tennis at the university. Bernadette Dornieden, a freshman biological sciences major, is from Germany. Dornieden feels it is an opportunity to play for the university. Katya Cornejo, a sophomore engineering technology major, is from Mexico. Cornejo described that she and her teammates have bonded and created a family dynamic. “It’s a wonderful experience being on this team because you don’t have your family here but you create a family out of your teammates, and we are always pushing each other to do the best we can,” said Cornejo. Putri Insani, a freshman accounting major, is from Indonesia. Insani explained the process she underwent before she joined the team. According to Yanez, Head Coach Jason Hayes motivates them to be the best they can be.